Even as con­ser­vat­ives in both cham­bers are clam­or­ing for spend­ing cuts, not just to Planned Par­ent­hood but to a slew of nondefense pro­grams, Re­pub­lic­an lead­ers are pre­par­ing to be­gin mak­ing a deal with Pres­id­ent Obama to raise spend­ing caps that will hit next year. On Wed­nes­day, Con­gress will pass a con­tinu­ing res­ol­u­tion fund­ing the gov­ern­ment for just over two months, put­ting an end to fears of a gov­ern­ment shut­down this week—for now. On the ho­ri­zon, Con­gress faces a po­ten­tially bit­ter battle in Decem­ber to keep the gov­ern­ment open once again, this time with a new speak­er of the House and an em­boldened group of con­ser­vat­ives in the House. With that fight loom­ing, Sen­ate Ma­jor­ity Lead­er Mitch Mc­Con­nell spoke last week with House Speak­er John Boehner and Obama to be­gin ne­go­ti­ations that will raise the se­quest­ra­tion spend­ing caps over the next two years, Mc­Con­nell told re­port­ers Tues­day. The phone call last Thursday marks the first step by Re­pub­lic­ans in re­spond­ing to a months-long fili­buster push by Demo­crats, who re­fused to take up any spend­ing bills un­til the ma­jor­ity agreed to raise spend­ing caps on nondefense pro­grams. Re­pub­lic­ans had pre­vi­ously agreed to raise the caps only for de­fense spend­ing—a no-go for Demo­crats, who worry that such a con­ces­sion will only lead to deep cuts to the party’s favored pro­grams, in­clud­ing per­en­ni­al tar­gets like wel­fare. The de­fense deal wasn’t much more pop­u­lar with con­ser­vat­ive mem­bers, con­cerned about out-of-con­trol fed­er­al spend­ing. Mc­Con­nell warned his party just two weeks ago that they would have to con­cede to Demo­crats on some points in or­der to get any real spend­ing bills through Con­gress over the next year. “We are in­ev­it­ably go­ing to end up in ne­go­ti­ations that will crack the Budget Con­trol Act once again,” he said. Boehner has been much more tight-lipped about what he would like to see in next year’s budget, even be­fore an­noun­cing his resig­na­tion last week. And it’s un­clear how his likely re­place­ment, House Ma­jor­ity Lead­er Kev­in Mc­Carthy, will pro­ceed—par­tic­u­larly as he courts con­ser­vat­ive mem­bers bent on spend­ing cuts in his bid for speak­er. Mc­Con­nell, who has said re­peatedly that he would ne­go­ti­ate dir­ectly with the White House over spend­ing—ig­nor­ing pleas from Demo­crat­ic lead­ers in Con­gress to sit down at the ne­go­ti­at­ing table with them—at­temp­ted to cut the minor­ity out of the ne­go­ti­ations in his talk with Boehner and Obama last week, two Demo­crat­ic aides said. Ac­cord­ing to the aides, Obama briefed Sen­ate Minor­ity Lead­er Harry Re­id and House Minor­ity Lead­er Nancy Pelosi dur­ing a pre­vi­ously sched­uled meet­ing just after the call. Mc­Con­nell had asked that the ne­go­ti­ations move for­ward between just him­self, Boehner, and Obama. But both the pres­id­ent and Boehner pushed back, in­sist­ing that in or­der to pass an even­tu­al deal through Con­gress, they’ll need the sup­port of Demo­crat­ic lead­ers on both sides of the Cap­it­ol. 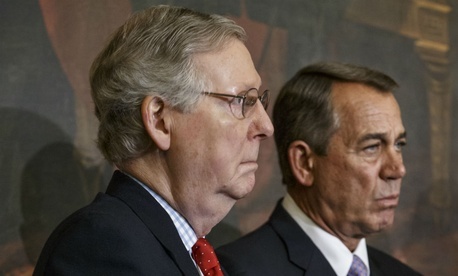 Aides to both Mc­Con­nell and Boehner de­clined to com­ment on the call. Since then, the White House has worked to loop Demo­crat­ic lead­ers in on dis­cus­sions lead­ing up to their talks with Boehner and Mc­Con­nell, work­ing largely on a staff level at this point, one aide said. Re­id met with Shawn Donovan, the dir­ect­or of the Of­fice of Man­age­ment and Budget, to dis­cuss the is­sue last week. Mc­Con­nell said Thursday that he hopes to set new top-line spend­ing levels for both fisc­al years 2016 and 2017, al­low­ing Con­gress to go through the reg­u­lar ap­pro­pri­ations pro­cess next year and pass 12 spend­ing bills—one of Mc­Con­nell’s ma­jor goals as lead­er—rather than passing an­oth­er last-minute, shut­down-avoid­ing con­tinu­ing res­ol­u­tion as the two cham­bers have re­peatedly done over the last sev­er­al years. Sen. Patty Mur­ray, who along with Rep. Paul Ry­an ne­go­ti­ated the last two-year budget deal to pass through Con­gress, said Tues­day that she was hope­ful that Re­pub­lic­ans would sit down with Demo­crats and come to an­oth­er spend­ing deal after passing the two-month con­tinu­ing res­ol­u­tion later this week. House Minor­ity Whip Steny Hoy­er warned earli­er Tues­day that Demo­crats will not ac­cept the planned se­quest­ra­tion cuts to nondefense pro­grams next year, not­ing that Obama and even House Ap­pro­pri­ations Chair­man Har­old Ro­gers have said re­peatedly that those fund­ing num­bers “will not work.” Ab­sent an agree­ment, Hoy­er warned, Con­gress will be headed for yet an­oth­er shut­down. “We don’t want to shut down the gov­ern­ment, but at the same time we’re not go­ing to be dra­gooned in­to do­ing any­thing and everything just be­cause they threaten to shut down gov­ern­ment,” Hoy­er told re­port­ers Tues­day.